Milwaukee home care workers gathered with community supporters and government leaders recently for a candlelight vigil they hoped would shed light on wage and benefit negotiations with the Milwaukee Center for Independence. 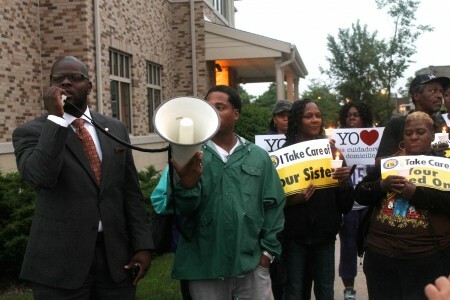 Vigil attendees were protesting MCFI’s New Health Services (NHS) program. NHS is a taxpayer-funded home care program and is designed to provide older adults and people with disabilities the opportunity to continue living at home while receiving assistance from a caregiver. Through this program, nearly 1,200 caregivers provide services to more than 1,400 Milwaukee residents, according to MCFI. About two dozen people participated in the event. For more than an hour, home care workers and their supporters marched in front of the MCFI building at 2020 W. Wells St. waving signs, chanting and encouraging passersby to stand with the home care workers. “We came out on this rainy evening to hold a light up to MCFI so everyone knows what they’re doing to these workers,” said African-American Roundtable Co-Chair Rosalynn Wolfe. 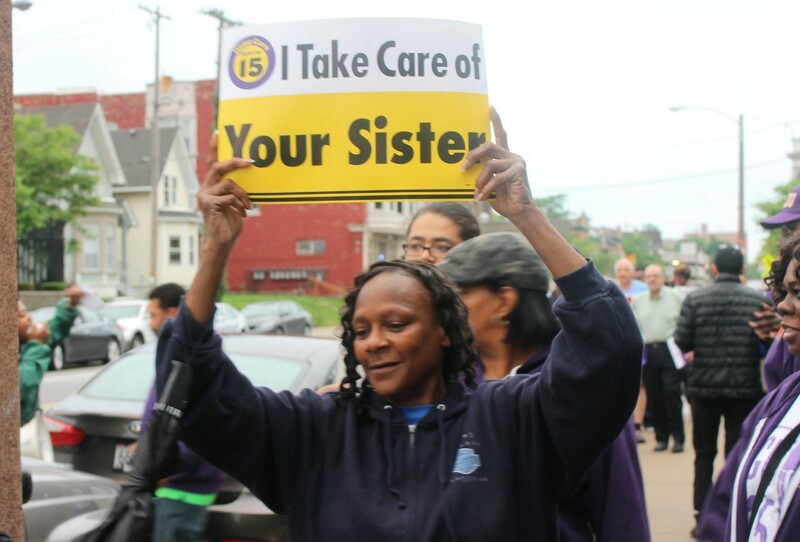 The caregivers make $11.66 an hour based on the Milwaukee County Living Wage Ordinance. With the help of their union, SEIU Healthcare Wisconsin, they are attempting to renegotiate their contracts with MCFI to receive paid time off and a $15 an hour wage. Sylvia Moreno has been employed as an NHS home care worker for two years. “We work hard every day and deserve to be treated with the same dignity and respect we provide daily to our clients,” Moreno said at the vigil. “Home care workers restore hope to people who are vulnerable and dignity to those who have fallen. It’s a difficult, taxing job and these folks deserve a decent wage for doing it,” Wolfe added. Martha De La Rosa, chapter director of 9to5 Wisconsin, which is a union of working women, pointed out that home care workers often need to choose between earning a paycheck and spending time with their own families. Her mother was a home care worker for 25 years and her sister serves as a caregiver today. County Supervisor Supreme Moore Omokunde, who spoke at the vigil, also talked about his experience watching family members, including an aunt and cousins, serve as home care workers. According to MCFI Director of Communications Nan Bialek, NHS has been in negotiations with SEIU representatives since January and was aware of the picketing. Bialek declined to offer additional details on the issues being discussed, since the negotiations are ongoing. The group gathered outside MCFI’s headquarters seemed confident that their demands would be met. We all want higher wages…get in line.